Well this morning the pyro was reading 80. I stuck my hand in through one of the spy holes and it didn’t feel as much as that so I took the four spies out and went and had a cuppa and tidied up the workshop. Here’s the first view of the top. Blimey it got hot up there! Mighty glad we didn’t go on any longer. The cones at the top all went completley over, I usually fire to 03 over, this was 02 over and some. Will put a hotter cone in next time just in case, would have been interesting to know. My honey glaze has loads of iron in it and where it got really hot it’s gone pretty dark, not always in a bed way though. Some of my pics are blurry – again! Must try to be better at not wobbling around. This is the middle front, the mug on the right is I think my 3rd favourite in the firing. I like the slip and body combination and althought he sprigs were a sort of mickey take amusement thing I rather like them as it turns out. Funny. This charger was leant up against the side wall, the one that backs onto the firebox. It has a glaze on that is new to me, nice glaze, very glassy but I’ve put it on too thick in the centre unfortunatly. On the rim where it’s thinner it looks lots better. Shame really. Kind of nice though and lots of potential there. I know lots of the Toft chargers were fired on their rims and I wanted to find out what would happen to mine if I did the same. The rim has only buckled very slightly. “Ooh” men. I had 4 of these in, just wee things to amuse me by. 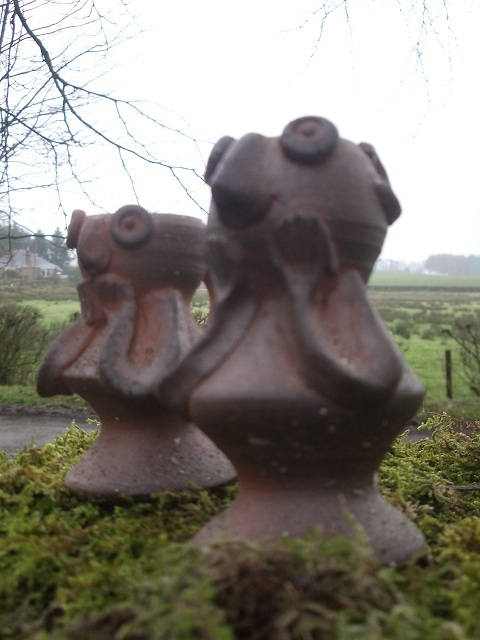 They are naked and were fired raw right where the flame comes into the kiln, boy did they get hammered, boy do I like them! 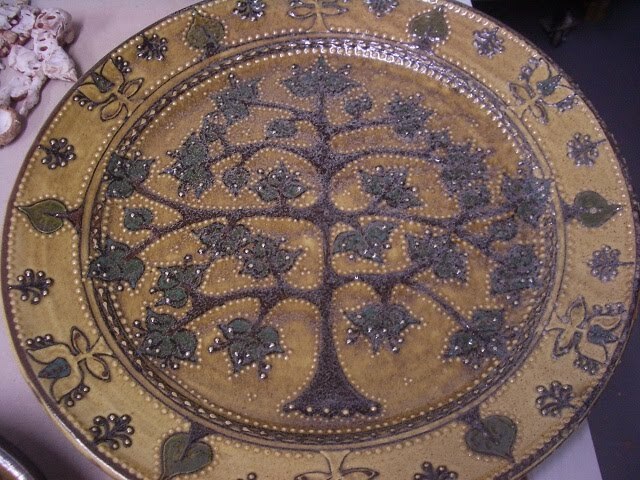 It’s massively more successful than the first firing, I suppose it flipping well should be shouldn’t it. I wish my firing squad from wednesday had been around when I unpacked though, would have been good to talk them through as I got them out of the kiln. 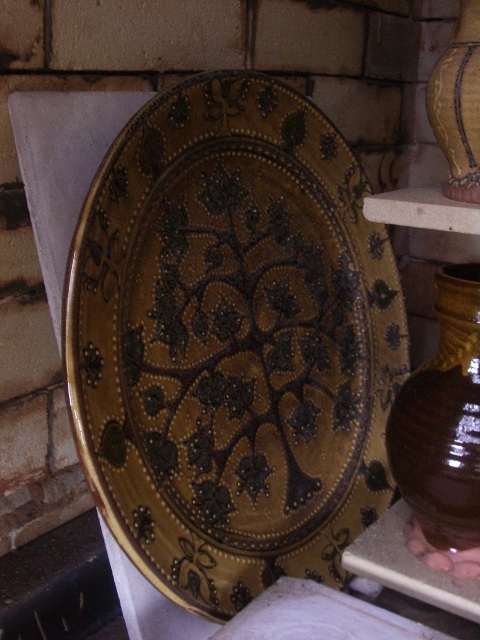 Picture above, bottom shelf, back of kiln. The clay body where it was naked has got some wonderful flashing and colours, deep metalic in parts, beautiful. So here’s a good bunch of them. I need to sit and go through them all properly yet. 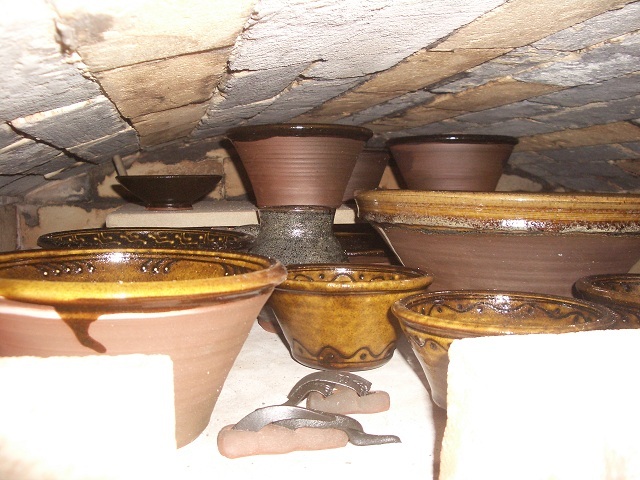 I want to split all the three glazes up and look at how they all were in each part of the kiln. There’s a lovely plate that I seem to have failed to photograph too, about 10″ diameter, I slipped it last week and blogged it, brushed slip and feathers trailed on. It’s come out good. There are about a dozen that are either cracked from the thermal shock (one of the big chargers but it was rather brown too from over firing) or that had bubbled and not fully settled. 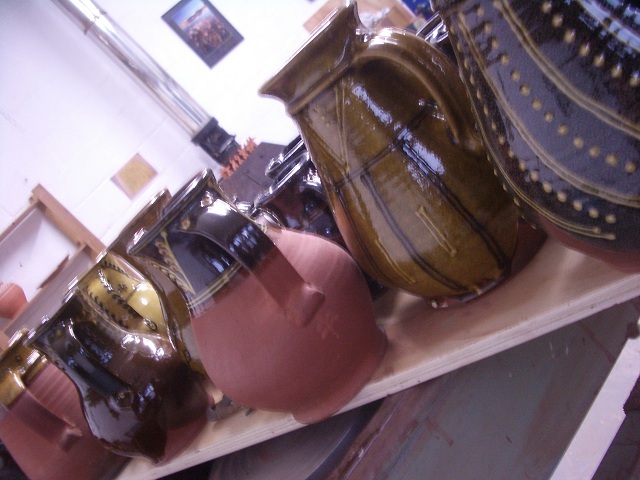 Then there’s a few that are heading for the dark brown area of pottery though of course “brown is a colour too”. There are though at the moment I think a dozen really great pots (to me) and lots of quite good pots too. What’s next? Write down what to change the next time and get on with flipping making! Heck it takes a lot of lot of pots to fill it! Best get a wiggle on hadn’t I. 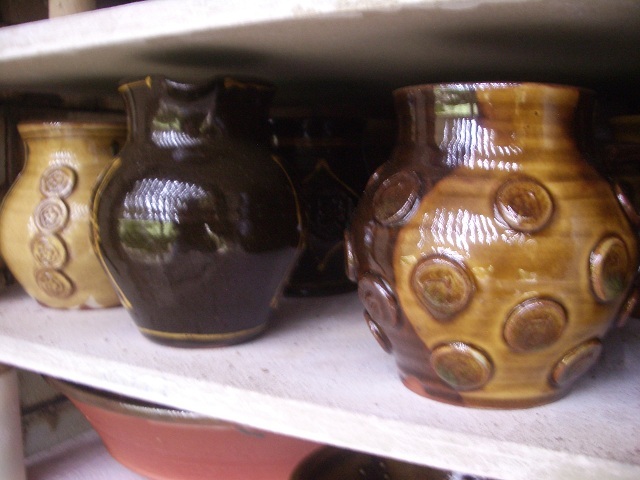 This entry was posted in chargers, jug, pancheons, wood fired pots, wood kiln. Bookmark the permalink. Really love the photo of them all set out – you should be really, really pleased. They are quite beautiful. What does slipped and 'blogged' mean? Does that mean I shall see it in a past blog or something else entirely?? I really need to get a book for UK slang. 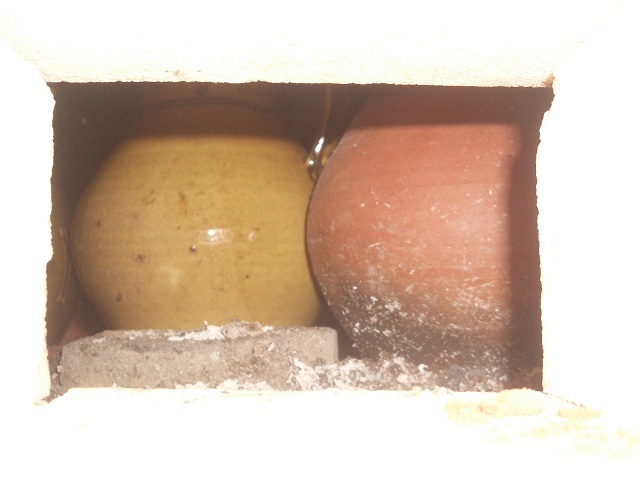 Looks good from here.I don't think you opened too soon.Those that cracked probably had stresses built up during the firing and were bound to fail anyway.Some pots we kill, but some just commit suicide. Fantastic Hannah! And that charger? Beautiful to me! I agree with Dennis. Looks pretty good from this side of the ocean. Let's see what they look like when they come out. Oops. Wait … they're already out. I still think they look good. Cool that you fired that charger on the side. I'm totally down with creative stacking. Those little men are too cute. Everything looks fab. Glad you are a happy girl. Talk to ya soon. A good toasty firing- this kiln is getting exciting and you're obviously learning something every firing- always a good incentive to do the next one!! Wow Hannah! Give yourself a HUGE pat on the back!. Well done, these are beyond beautiful. Wish I lived closer, I would be packing up a box full for myself!! just beautiful Hannah … I love the yummy rich colors! 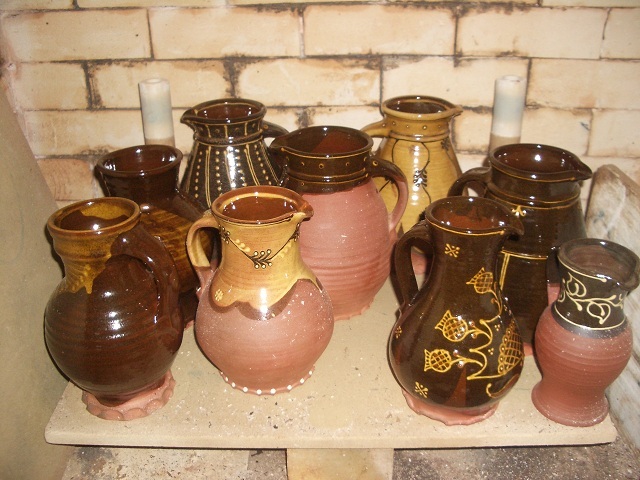 Was drawing slipware in the V&A today and wondering how the firing went-looks wonderful.V. nice charger. Looks great Hannah, and what a great firing team. I love the way you fired that large charger, and it looks great love the colour's. 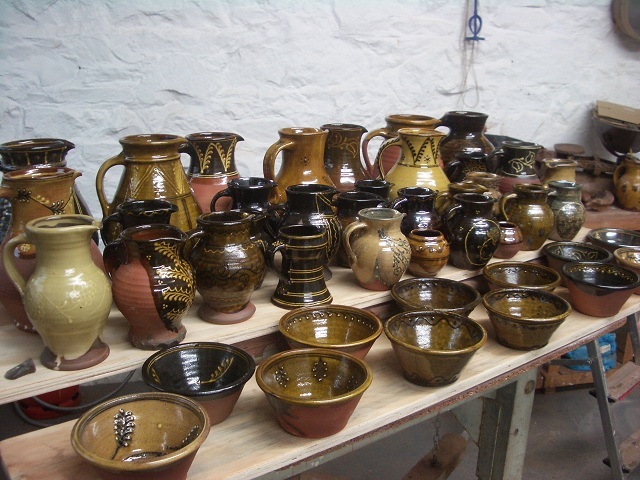 very brave to put so many good pots in a wood firing. Lovely work Hannah, how nice to see the wood fired kiln in action again.